Access data from our network of sensors, available as an .xls or a .csv file. 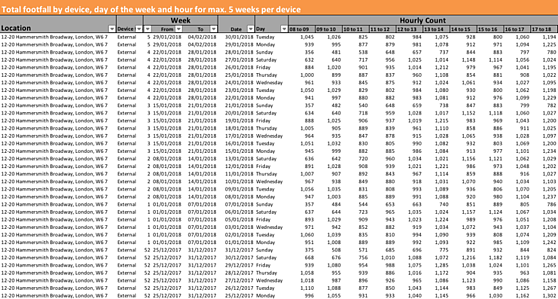 We segment these footfall counts by hour, day, week or month as required and provide information split by location in the most appropriate way for your analysis. To download your copy of sample file please complete the form on this page. You will receive an email with your report shortly. If you have any problems with the download, please contact marketing@locadatacompany.com and we will come back to you as soon as we can. If you have any other questions or would like to enquire about pricing, please get in touch at sales@localdatacompany.com or call us on 0203 111 4393.